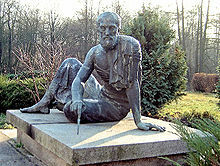 Archimedes was born 287 BC in the city of Syracuse, Sicily. He died 212 BC during the Second Punic War, when Roman forces captured the city of Syracuse. During this time, Archimedes was designing a mathematical diagram. A Roman soldier commanded him to meet with his general. Archimedes declined saying that he had to finish the problem. Hearing this, the soldier killed Archimedes with his sword. The last words that supposedly Archimedes had said were, "Do not disturb my circles." However, there is no reliable evidence that Archimedes has said that. The tomb of Archimedes carried his favorite illustration of mathematical proof, consisting of a sphere and cylinder of the same height and diameter. 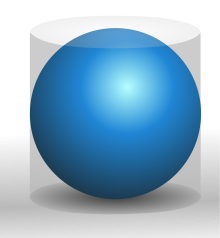 Archimedes had proven that the volume and the surface area of the sphere are two thirds of the cylinder including its bases.